TNT announced last week that “The Last Ship,” a drama following the crew of the fictional destroyer Nathan James as they rush to save the planet from a deadly outbreak, will premiere June 22 at 9 p.m. Eastern. Michael Bay will produce the series, which stars Eric Dane (“Grey’s Anatomy”) as the ship’s captain. See more about the show and the first, longer, trailer here. The above trailer premiered as part of SXSW, also known as South By Southwest — an Austin, Texas-based festival that mixes major corporate sponsors and TV giants with independent films and budding music superstars. TNT also screened the premiere episode at the festival. “The Last Ship” could be the lone Navy-related offering on broadcast or big-time cable television this year that doesn’t have “NCIS” in the title. The submarine-based thriller “Last Resort” went under in 2012, and a TV reboot of the “Act of Valor” franchise — the movie starred real-life Navy SEALs — that had been set for the National Geographic Channel first morphed into a show about Air Force pararescuemen, then disappeared entirely. So, based on the 102-second sneak preview above (and the promotional poster, right), will “Last Ship” sink, or save the day? Leave your thoughts in the comments below. 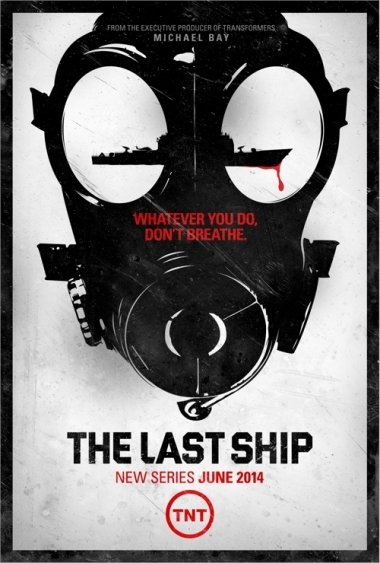 TNT should have researched the title more carefully because The Last Ship is the name of Sting’s new album which is also the soundtrack to the associated Broadway play. It just seems that a little research could have avoided the situation of having two productions of the same name at the same time, albeit two completely different stories.